There’s messy, and then there’s Miranda Lambert. This woman is a hurricane. That was just an appetizer to the main meal. This weekend, Miranda showed up on Instagram two days after Valentine’s Day to share a wedding photo “in honour of Valentine’s Day” (girl, it’s two days late! ), and I was like wow, that is quite the redirect for such a minor incident. And she didn’t stop at social media. 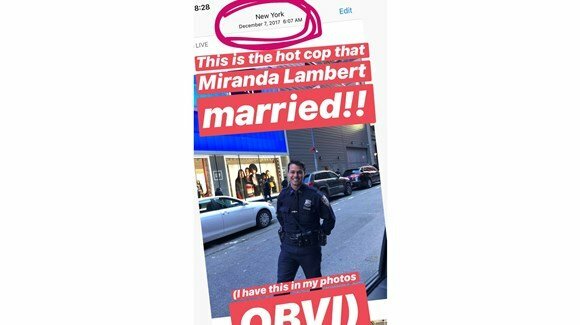 Conveniently, PEOPLE also had a wedding photo not included in her Instagram shots, as well as some very crisp images of Miranda and her new husband in Soho on Saturday, February, 16. The rings were on full display and they were holding hands. Some well-placed “sources” also managed to get a read on their mood and how happy they were. Look, tabloids work hard but the devil (social media) works harder, so by the time it hit that her new husband is an NYPD officer, it was already all over Twitter. Let’s look at the timing here: if the baby arrived on time in the month of November, that puts him around the 3-month mark. Interesting, considering someone from her team leaked that they got married “a while ago.” What’s “a while” in Miranda Lambert time? How long have they been married? Because, as I mentioned above, Miranda appeared on Good Morning America the first week of November. This is where Busy Philipps joins the story. Yes, Busy Philipps. 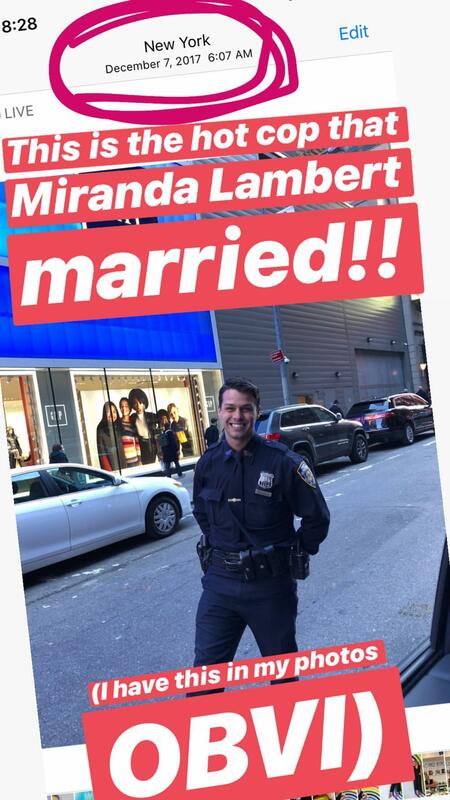 On Saturday night, Busy took to her favourite mode of communication (Instagram stories) and talked about how she knows Brendan, the “hot cop” who works crowd control at GMA – Busy has featured him on her stories before. Watch this and meet me on the other side. “I mean good for Miranda” – the tone, right? She’s being playful, obviously, but she was also happy to blow up Miranda’s spot on Instagram before it came out another way. Busy even theorizes that Miranda met him during a GMA appearance (which, considering the November 2 appearance, makes complete sense and I appreciate Busy’s good gossip). The fact that Miranda was singing “Got My Name Changed Back” while there just adds another layer of messiness to this story. There is no way of talking about this timeline without addressing what the f-ck is going on with the ex. Were they broken up when he met Miranda? If so, why did they choose to register for items together? Because I checked it out and they asked for one (1) crib, one (1) Baby on Board sign and one (1) play sleeper chair. If the baby were to have two homes, it would make sense to have some doubles. This leads to a bigger question: Is he involved in the baby’s life? At the time I wrote this, his ex’s social media is set to private (and I’m purposely not naming her because it’s not her fault her ex married Miranda Lambert) so we don’t know anything about her, besides her profession (lawyer). She could be completely private, or she could go the Staci Felker route and put everyone on blast. We will have to see. And I can tell you, people want to know. There is a lot of interest in this story because Miranda already has a “colourful reputation” and if there is a hint that she got involved with this dude while he had a pregnant girlfriend at home it will, fairly or unfairly, fall on her. 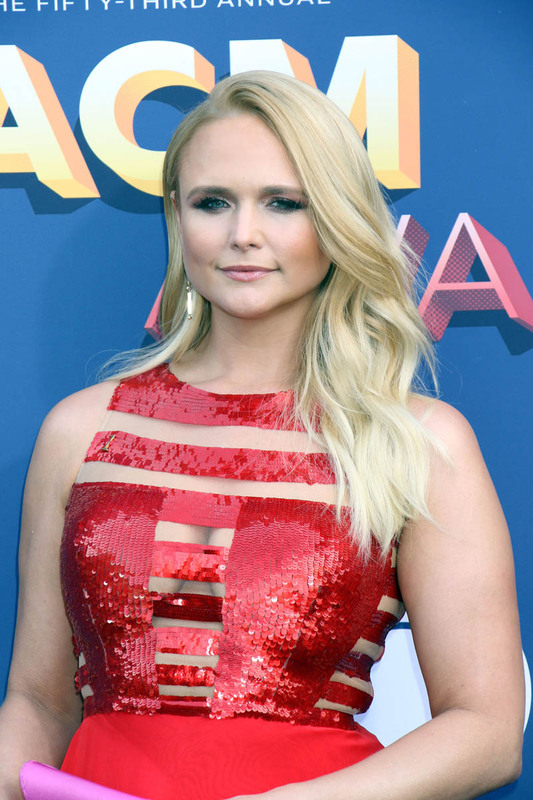 After Blake Shelton, then Anderson East and Evan Felker well, Miranda has talked about her own patterns before so we don’t need to play armchair psychiatrist. But we also don’t need to jump the gun with this story - it could be more like a Gisele Bundchen/Bridget Moynahan/Tom Brady situation (and now look at them: great friends). Besides the whole baby business, we know that there’s an 8-year age difference (not huge) between Miranda and Brendan. He lives in NYC and works as a police officer, and she lives in Tennessee and Nashville and is a country music star. So that’s a bit of a pickle. How long until he quits his job and becomes her head of security? And how much time can he spend away from New York considering he has an infant? Just a few months in (if that!) and there is already so much drama. A BABY (that’s not hers). Flipped salad plates. If he’s a cop, why was he cool with his wife doing that? And why did he need to be defended so vehemently? Knowing what we know now, what the f-ck was that about?! We thought we’d seen drama from Miranda and we have not seen a damn thing yet.